After a bit of a wait here is part 5 of The Patron, catch up here. The thug was still laughing, coughing blood through his teeth, when the car started to reverse. Two glowing red eyes getting larger as they drew near. The Patron had got as far as the next turn before he realised what he had left behind. It was amateur stuff and he needed to be better before the night was done. He cursed himself as he realised. Tonight’s wasn’t the kind of darkness that would be kind to mistakes. He stopped the car next to the thug who was trying to stagger to his feet. The Patron opened the door quick, about to smack it against the laughing fool’s face. Then he remembered the paintwork. He hustled over to crawl out of the passenger side. The first thing he did as he came round the car was clock the thug hard with an elbow. Not so funny now punk. He slumped to the floor unconscious again. Better hope he had good health care. The Patron leaned over and picked up his sword cane from the shadow beneath the bins. Never leave a man behind. Especially if the man has a pointy end. A pointy end can come in useful. He jumped back into the car and gunned it down towards the docks. 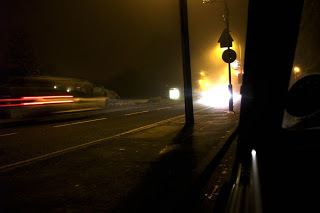 He dodged in and out of the traffic and through the fog. He left the radio off. The purr of his baby was all he needed. Class is it’s own concerto. The lights streamed by his window and all the while there was one thought pounding inside his head. He was going to be there. It had been years since their last meeting. There was a scar down The Patrons back to prove it. That and a twisted finger wrapped tight around the steering wheel. The scar itched now. The finger twitched like it was pressing down on a trigger. If he got his way that would happen soon enough. 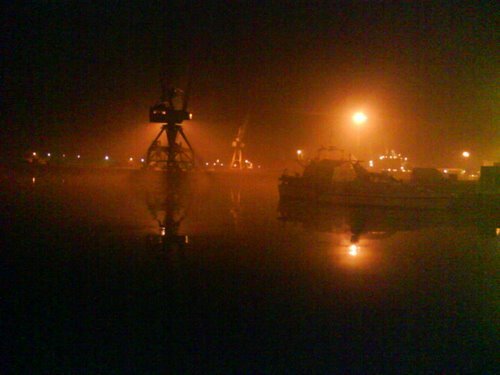 The docks appeared out of the fog like the mouth of hell. Cranes raised up to either side like fangs. The lights of industry burned in the mist. He pulled up out of the way behind a shack further down the road. No need to advertise. Someone would spot him soon enough. There were a couple of big lads hanging around outside the gates, real casual like they were just having a smoke break. He wasn’t in Kansas any more. If Toto was clever he’d have legged it by now. Dogs are smarter than us though. The Patron took the first guy as he strolled up, pretending he was lost. The second went down just as quick, slumped against the rusted fence. They were look out boys, not the real muscle. They were waiting inside. The Patron already knew that he was expecting him. The gate wasn’t even chained. Made things a little easier at least. No need to scratch the paintwork. They opened with a screech of the hinges. So much for not advertising. The blood was roaring through The Patron by then anyway. His knuckles were white on the cane. The confident fool was probably looking forward to springing that trap by now. So was The Patron. He walked through the fog between the stacked shipping containers. It was a confusing array of alleys marked by twisted metal that pointed down towards the sea. He’d been waiting too long for this, The Patron thought. The sharp point of his cane lead the way deeper into the maze.